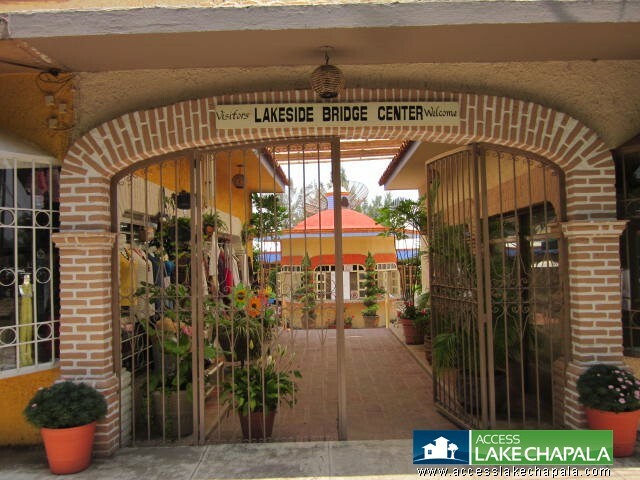 Located in Riberas del Pilar, next to Mom’s Deli. It is easy to find. 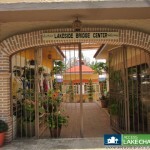 Just look for the Mom’s Deli sign on the side of the building and then the Lakeside Bridge Center sign on the arch over the entrance to both places. 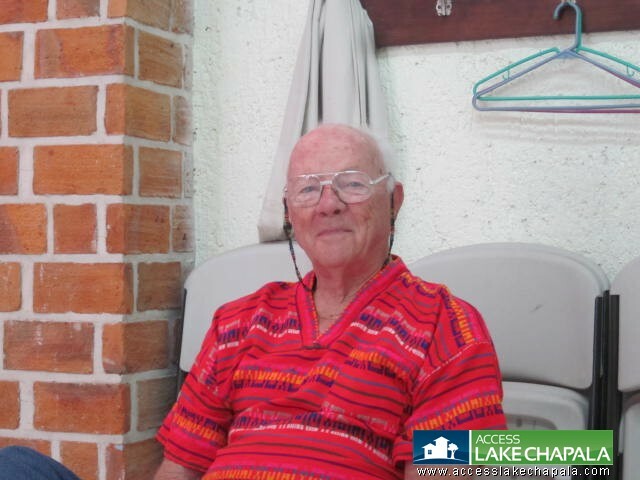 It is on the lake side of the carretera. 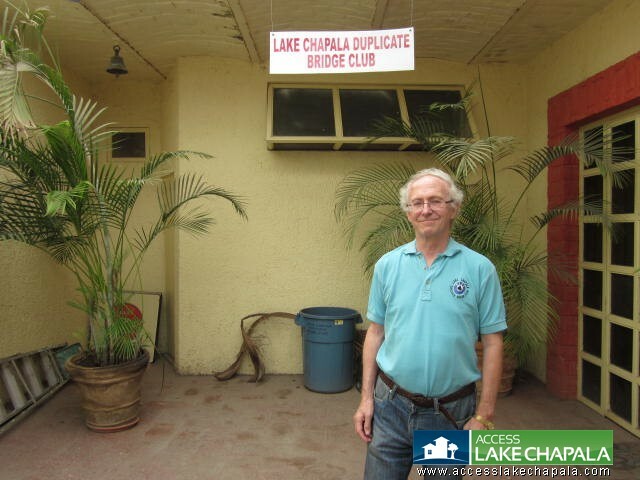 After you enter under the arch, turn left and you will see a small garden area and the Lake Chapala Duplicate Bridge Club sign. It is a welcoming place. If you love Bridge, you will love the Bridge Club. 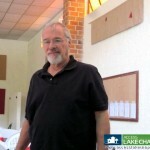 I met Lew Crippen, president of the club there and he was kind enough to share some of his time to give me an interview. There are even several people who have moved to this area mainly because of the bridge club. That is devotion. 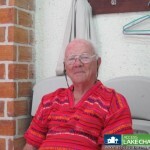 Lew and his wife moved here six years ago from Dallas, Texas. 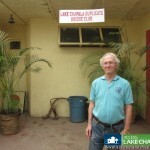 They have lived all around the world and have chosen to make their permanent home at lakeside. Lew played bridge in high school and college but didn’t play again until he moved here. He quickly became involved in the game again and four and a half years ago he was elected president of the club. 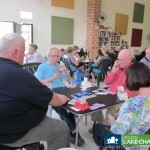 They only play duplicate Bridge at the club but Lew teaches both kinds so people can play regular bridge in their homes. The club has been in existence here for over forty years. At one time they played at the Old Posada. They have moved at least four times since they were there. They have been at their current location for three years. There are a hundred and seventy-five members now. Once a year, in January, people pay a hundred pesos for their yearly dues. Members pay only thirty-five pesos per session and non-members pay fifty pesos per session. 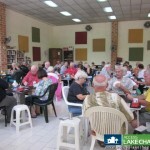 During the high season there are eleven to twenty tables per session. During the low season there are five to eleven tables per session. There are only a few full time Bridge clubs in Mexico. One is in Guadalajara. One is in Puerto Vallarta. Two are in Mexico City. One is in San Miguel de Allende. There are two part-time clubs that are only open in the high season. One is in Mazatlan and one is in Cabo San Lucas. For the regular games, most people show up with a partner. There is an online site to request a partner if you don’t have one. It is chapalabridge.com. During the year they play four times a week in the afternoon. Anyone can play in the open games. They sponsor one tournament a year, usually at the Real De Chapala. Top players from all over Mexico show up. It is the second weekend in February. It starts Thursday night. It goes on into Friday, Saturday and Sunday. There are twenty to thirty tables each day, a hundred and fifty tables for the weekend. The cost is eleven dollars to play per session, per person. Just show up if you are interested. 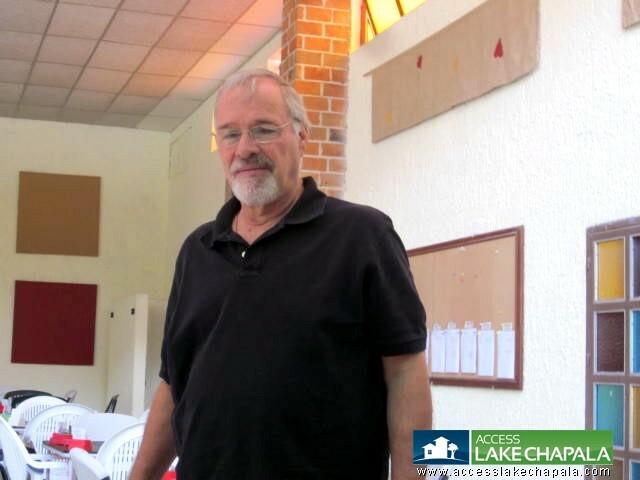 Also members of the Lakeside Club put on a tournament once a year in Puerto Vallarta. It is the first weekend of November and lasts an entire week. It is an open competition. People with zero master points play with people who have almost two thousand master points. A master point is given when you win a game, or a partial point is given when you come in second or third. So you can imagine how much bridge you would have to play and win to get 1800 master points. That is what one man has who sometimes plays in the tournaments. He moved to this area part-time so he could play bridge at the club. 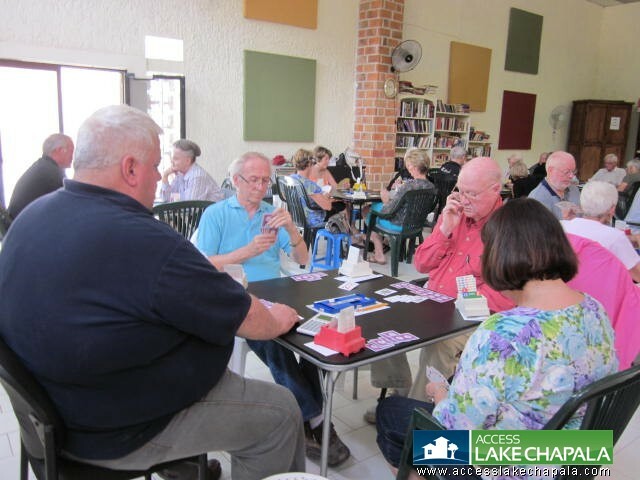 The American Contract Bridge League, (ACBL) is the governing body for Bridge in Canada, Mexico, U.S., Bermuda and the Virgin Islands. Interest in Bridge was at its peak in the 1950’s and 1960’s. It was to young people what video games are to young people today. The Bridge Club sponsors at least three parties a year. One is coming up on July 13th. It will be held at a private home and it will be catered by Manix Restaurant. The parties are held in different places and the members get a discount price. They can bring a significant other but they have to pay a little more. 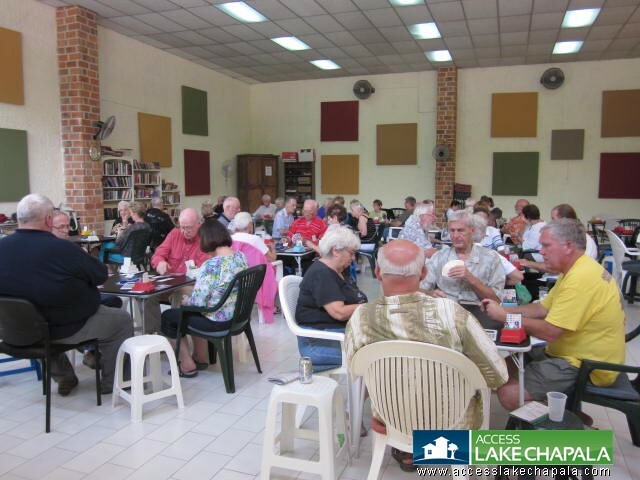 The club subsidizes the meals for members. They sponsor a party at Christmas and one before the Snow Birds go home. The Director of games makes sure that people play in a timely manner and they have a zero tolerance policy about arguments. If a player gets upset he or she gets a penalty. Then if it happens again, he or she has to leave the game. Bill Atim is the organizer. 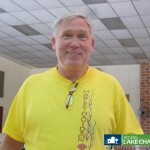 He appoints the directors and takes care of whatever else needs to be done to keep the games running smoothly. The treasurer is Steve Penning. 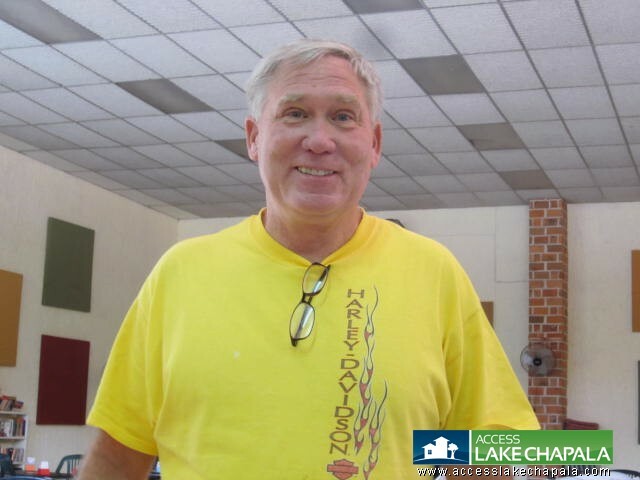 Lew Crippen gives four-week courses for regular bridge. The cost is two hundred pesos and that includes a twelve-dollar book. There is also a six-week course. It includes two books. There is a new course starting next Tuesday. It is a continuation of a previous course. It is only three hundred pesos. The current fees for a non-subsidized club are the lowest of any organized club. Most places charge eight to nine dollars per session. One reason is that it is an all-volunteer organization. There are six to seven people who do things on a regular basis, from directing the games to collecting the money. The volunteers get a few free games. There are seven people on the board. The club is open from 1:30 to 5:00 p.m. Monday, Tuesday, Thursday, and Friday. It is also open on Friday from 9:30 to 12:00. 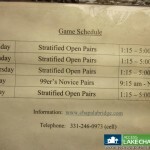 Lessons vary but are usually from 10:00 to 12:00 on Tuesday and Thursday. 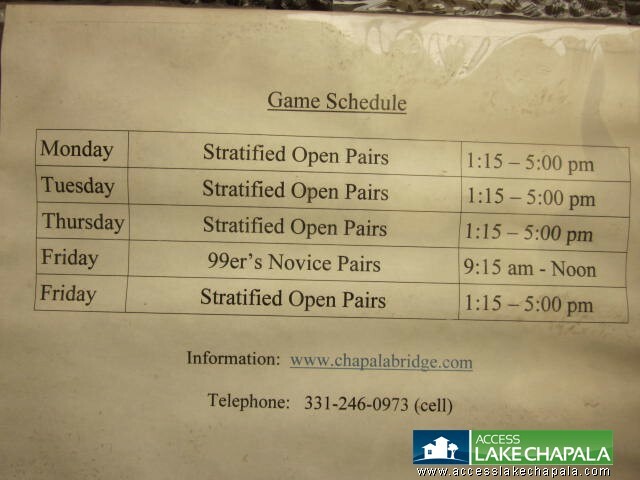 Call in if you want to take a lesson. Call Lew Crippen at: 766-1119. Or if you have any other questions about the club, you can e mail Lew at: lewcrippen@gmail.com. They also have a book exchange at the club. Leave a book. Take a book.